We supply a turn-key mobile advertising solution with the largest and most view-able equipment in the USA. No minimum booking days with flexible scheduling… You may book a mobile billboard for a day, weekend, weekdays, consecutive weeks or months. Each of our identical mobile billboard units display a large 10′ x 22′ double-sided sign with a tall front and rear panel. Our mobile billboard trucks are operated by our own skilled drivers and are strictly monitored through real-time GPS satellite tracking systems. Our clients also have the ability to easily check on their billboards 24/7 over the internet with a PC, laptop or smart phone. 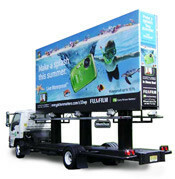 Our eye-catching mobile billboards can cruise slowly along the busiest roads of a strategically planned route, gain exposure in bumper-to-bumper traffic, target specific neighborhoods or zip codes; in addition to positioning themselves near shopping malls, supermarkets, concerts, conventions, sporting events, street fairs, transit hubs, beach locations and other desirable high-demand venues. We operate out of our Northeastern New Jersey billboard facility near Newark International Airport. We make it super-easy to rent a billboard for your outdoor marketing needs, with a special emphasis on quick turnaround for the tri-state markets. Our large mobile billboards are an affordable alternative to the more traditional advertising venues such as, stationary billboards, newspapers, radio and TV. 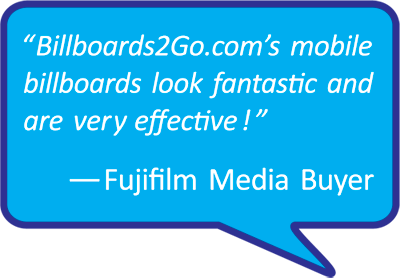 Contact us today to find out how much our mobile billboards cost for an ad campaign. With our impressive 100% Guaranteed Proof–of–Performance we are a trusted media vendor to many major brands as well as countless small businesses. We (really) love what we do, so the least we can do is make sure YOU love what we do. To learn more about our proof-of-performance and other unique features of our media service, please visit the NEWS page on this web site.